Haunting and joyous, this is everything good folk music should be. Colorado folk balladeers Elephant Revival return for a new album, the fifth since their debut. Active since 2006, this band made up of Bonnie Paine, Bridget Law, Dango Rose, Daniel Rodriguez, and Charlie Rose incorporates elements of folk and Americana to craft a uniquely rich, intimately piercing sound. “Shadows Past", the dreamy album opener, mixes melodic picking and soft-spoken menace, launching from banjo-driven folk into a middle eastern fantasy scored with hand drums and Bridget Law’s screaming gypsy fiddle. Switching between modes with a whispered “one, two, three", the quintet evokes mystery, joy, and understated awe. Not bad for three minutes and change. “Sands of Now", the title track, uses a Celtic melody touched with melancholy to celebrate abundance that is “bursting blue at the seams". The track has a laidback Django Reinhardt energy, and Law’s saucy, inventive playing brings the stars down to “a stone’s throw away". “Drop” revels in blues-flavored instrumentation and mind-bending surrealism. Bonnie Paine’s haunting vocals provide the gossamer thread that holds this track together, and the appreciative live audience on the recording agrees. “Fallout Fields” is lyrical and slow, reveling in whispery vocal harmonies. 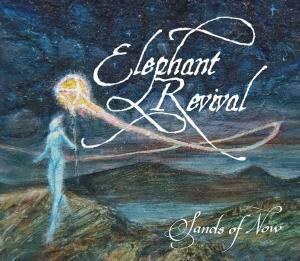 Like many Elephant Revival tracks, the song builds to an explosive, driving climax and features deftly interwoven playing. “The Garden” explores Eden imagery with a serpent’s “venom spitting riddles", but eschews bombast in favor of subtle, intricate melodies. “Will Carry On” drifts in with a gentle unaccompanied female voice and meanders along towards acceptance that “we may never be perfect". Embellished with whistling and Law’s countryfied fiddle, the song is a sweet (but not saccharine) ode to contentment. “Spinning” continues the inspirational folk fest, while “Stolen” allows a rare note of lament to pass like La Llorona’s shadow over the otherwise ebullient Sands of Now. “Lost Creek” is whimsical and irreverent, almost abrasive at times, a bracing tonic in the midst of the album’s melodic flow. “Cosmic Pulse” meditates on time’s river while overlapping vocals and a soaring violin seduce into the realm of dreams. Playful and delicate, “Echo’s Rose” evokes romantic intrigue, while “Sing to the Mountain” closes the album on an appropriately majestic note, festooned with banjo, guitar, violin, and howls to the moon. The song is quietly epic, alive with mystery and a desire for connection. This is everything good folk music should be. Elephant Revival doesn’t reinvent the wheel. Its music is beautifully played and conceived with intelligence and deep genre knowledge, but the individual elements that make it up were already there for the taking—the flotsam and jetsam of American music. The band’s talent lies not just in its playing, but in the way it combines different existing modes of folk music. Lyrics that would seem cliché in the hands of lesser musicians are elevated; traditional melodies sound fresh. These songs are compiled with a refreshing lack of production overlay and artifice. They are clean and crisp, simply presented without being “gritty.” At once ephemeral and truthful, this restless music is perfectly suited to journeys both literal and spiritual. Elephant Revival is interested in exploring connections, and this remarkable album does just that: stitching a cosmic folk tapestry from whole cloth.